The Rice Professional MBA is a flexible program that offers an evening or weekend option to allow students to maintain their current work schedules. Students following either of the program structures must complete 54 credit hours and will complete their MBA degree in 22 months. The traditional professional MBA is held in a lock-step format. There is also an option to complete an Extended Professional MBA program, which holds classes two evenings a week during the first semester and one evening a week after that. Students in this program can extend their education for three years or more, up to five, in order to better fit with their schedule. Students in Rice University’s Evening Professional MBA program will take 12 credits in the first semester, 16.5 credits in the spring of the first year, 12 credits in the fall of the second year and 13.5 credits in the spring of the second year. Students in the Weekend Professional MBA program will take 14.25 credits in the first fall semester, 13.5 in the first spring, 14.25 credits in the second fall semester, and 12 credits in the last spring semester. Both program structures feature two mandatory six-day Immersions. Students will take part in a variety of career development and academic workshop opportunities, as well as team-building exercises. They will also begin their classes. Evening students do their Immersion in July before the first year starts and in March of the second year. Weekend students will do their Immersion in July before each year starts. Just like the full-time program, during the first year of the Rice University MBA for Professionals students will participate in the core courses required to build a foundation in business and management and the second year will feature student-selected electives. Students in the Professional MBA program at Rice are not able to complete a concentration. 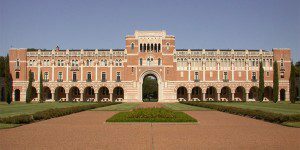 The Rice University Jones Graduate School of Business notes that 188 students are currently enrolled in its Professional MBA program, with 125 Evening students and 63 Weekend students. About 28 percent of the class features female students, and 11 percent of the class are international students. The average age of the class is 30, the average GMAT is 637, and the GPA mean is 3.3. Students typically enroll with 6.6 years of work experience. The total cost for the Rice University MBA for Professionals is $107,750 for the Evening and Evening Extended programs and $112,750 for the Weekend program. The tuition covers the complete 22-month schedule of coursework and is billed in 25 percent increments over four semesters. An enrollment deposit of $2,500 is due upon acceptance and will be applied toward your first semester bill. Many students supplement their tuition costs through company financial support. Students may also cover tuition costs with Federal Financial Aid, Federal Student Loans, and private loans. Complete an online application, two required personal essays and an optional third, a professional resume, and official test scores submitted to Rice University (GMAT, GRE, TOEFL, or PTE Academic).